Jason Kessler, who described dead counter-protestor Heather Heyer as a "fat, disgusting Communist," was filmed being initiated into the Proud Boys. The founder of the far-right “Proud Boys” has gone on the record disavowing the so-called “alt-right” – but the condemnation doesn’t mean much, since one of its own members was a main organizer for the “Unite the Right” rally in Charlottesville. But McInnes’ piece ignored the role members of Proud Boys played in the violence in Charlottesville nearly two weeks ago. 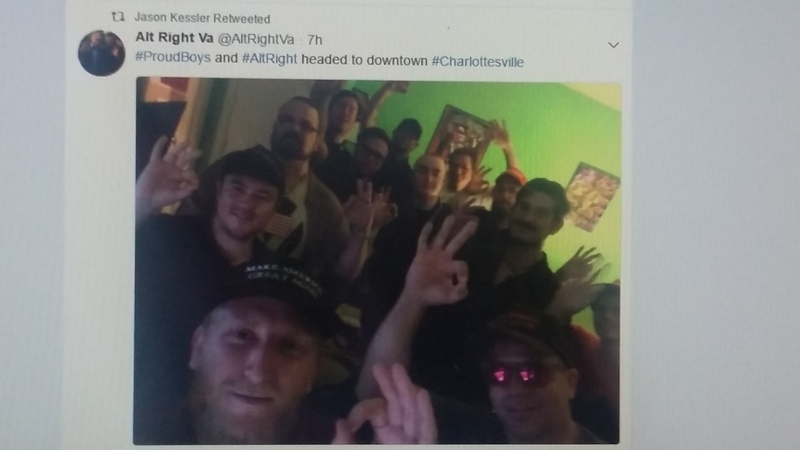 Jason Kessler, a self-described “journalist and activist” who helped organize the Charlottesville rally, was a documented member of the Proud Boys. The Southern Poverty Law Center describes him as a “relative newcomer to the white nationalist scene” who has pointedly called Charlottesville’s only black councilman as a “pavement ape ” and “Councilman Dindu.” In June, he wrote an article titled “Yes Virginia (Dare), There Is Such A Thing As A White Genocide”. Kessler later tweeted, “I repudiate the heinous tweet that was sent from my account last night” and said that he had taken a combination of Xanax, ambien, and alcohol and did not remember what he’d done that night. McInnes helped co-found VICE in 1994, but he severed ties with the magazine a decade ago. He founded Proud Boys in 2016 and has recently tied them with the Fraternal Order of Alt Knights (FOAK), who serve as the “tactical defensive arm” of the Proud Boys.